The alchemical picture of the Vitriol seven-pointed star (septagram) reveals – like hardly any other picture – the deep knowledge of great alchemists such as Paracelsus. It shows their knowledge on the influence of the seven planets on and the course of life energy in the human being and even the living body of our earth. Ancient alchemical scriptures often had been intentionally made very difficult to understand. Many alchemists – Paracelsus too – were treated with various forms of hostility. They often travelled throughout their lifetimes in Europe, some even went across the Middle East and North Africa in order to escape the greed of rulers and the narrow-mindedness of churchmen at that time. Due to this threat however, they could not lay their knowledge entirely open in books. Thus they referred to it in allegories, used secret names for important substances and laboratory procedures, and drew cryptic pictures with varied levels of meaning. This contributes to the difficulty nowadays to comprehend their theoretical and practical knowledge. Therefore comparative studies of the ancient scriptures and at the same time practical investigations in the laboratory for more than twenty years have been necessary to rediscover Paracelsus’ healing elixirs, such as, for instance, the gold essence ”Aurum Potabile” (see issue no. 6 and 7). Only in this way the most important basis for the high art of alchemy could be deciphered, namely – as described in the last issue – the knowledge of the secret solvents of alchemy, with the help of which only production of the ”High Arcana” (this is the term for the most supreme remedies of alchemy) from metals and gems is possible. What level of deep significance needs to be deciphered in the symbolic pictures of alchemy thereby, is amply demonstrated by the examples of the ”Vitriol seven-pointed star” and the ”planetary man”. 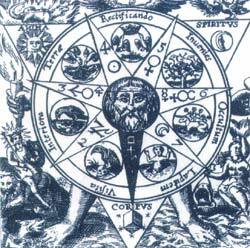 The Vitriol seven-pointed star is one of the most famous pictures of all alchemy. It was reproduced in different versions by several authors. In the Middle Ages its secret knowledge was of such an importance that the occult Order of the Knight Templars even ”engraved” the seven-pointed star on the French landscape through buildings. And this was done in an ingenious geomantic (i.e. according to knowledge of earth energies) way, which also reveals an amazing knowledge about the alchemical meaning of the Vitriol seven-pointed star. More about this later, first let us have a look at the main components of the picture. The famous alchemical seven-pointed star with the VITRIOL formula. In its centre the Vitriol seven-pointed star has a face to which the two hands on the left and on the right seem to belong, and the two feet as well. These four extremities refer to the four elements: in one hand there is a torch representing the element of fire, in the other hand there is an air bladder (Vesica Piscis) representing the element of air; one foot stands on the ground, and the other one in water. The fifth element is often overlooked but sits enthroned on the very top as the double wing of Hermes. The five symbols of elements are arranged in a regular pentagon. Beside the feet a king and a queen are seated with the symbols of Sun and Moon symbolising the polar powers of nature. Furthermore the picture shows three different forms: a triangle, a circle and a seven-pointed star. The triangle represents the trinity of body, spirit and soul, if one follows the inscriptions on the angles: ”corpus”, ”anima” and ”spiritus”, or, in alchemy, for sal (= body, the solidifying principle), sulphur (= soul, the moving principle) and mercurius (= spirit, the connecting principle). Planetary man, by Gichtel. The seven planets mark the ”furnaces of the soul”, as the alchemists called the seven chakras. Upon this triangle there is a circle with seven emblems and an inscription as follows: ”Visita Interiora Terrae Rectificando Invenies Occultum Lapidem”, in English: ”Search for the innermost of the earth, and you will, by rectifying, find the secret stone.” The first letters of all the Latin words form the name VITRIOL. In earlier times Vitriol was already known as copper or iron vitriol from which the alchemists made sulphuric acid for the processing of metals. But Vitriol is as well an alchemical symbol for the process of transmutation, thus meaning the legendary transformation from lead to gold. Related to man this means his transformation from darkness and disease to light, to health and to the dawning of consciousness. This process is nothing but the mythical path to the Holy Grail, since in the legends the Holy Grail stands for the achievement of a ”purer” and ”more illuminated” respectively ”more translucent” state. The seven emblems in the circle too refer to such a transformation from darkness to light and the rebirth on a higher level. They show symbols of the labour at the ”Great Work”, i.e. the transmutation from lead to gold; clockwise starting from the raven on the skull up to the unicorn and ”resurrection”. Raven and skull thereby represent the dark and matter in its slowest state of vibration, namely certain slag originating from a working process, so-called caput mortuum. Such slags are for instance ferric oxide or copper oxide that originate from the production of sulphuric acid out of metal sulphates, i.e. Vitriol. It was Paracelsus in particular who in his scriptures pointed out that even from such slags valuable things can be obtained. Here the emblem with the raven refers to a solvent containing ammoniac. The other pictures describe the process of obtaining a royal essence or the gold essence Aurum Potabile (symbolised by eagles carrying the crown); with their help – as shown in the last picture – man is elevated from darkness, earthiness and unconsciousness towards light, and thus ”reborn”, so-to-speak. Between each emblem one of the seven rays of the seven-pointed star is placed. On each ray there is one of the symbols of the seven planets starting, in accordance with the numbering of the rays, with Saturn, Jupiter, Mars, then Sun, Venus, Mercury, and finally Moon. The planets are traditionally assigned to certain metals: These are Saturn = lead (or Antimony, Vitriol ore), Jupiter = tin, Mars = iron, Sun = gold, Venus = copper, Mercury = mercury (or zinc), Moon = silver. By giving the names of planets an indication is as well given to the Great Work of the metals meaning the transformation from lead to gold. The sequence of the planets’ numbering from 1 to 7 corresponds to the so-called Chaldaic order of the planets. 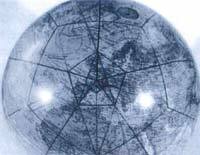 At that time the earth was supposed to be the centre of the planetary orbits. And the order that was established by the Chaldeans 3000 years ago was intended to mark their decreasing distance from the earth. It is amazing: when the seven classical planets are put into an order according to their average orbital speed starting with the slowest planet Saturn, the same sequence results. Thus it is a very reasonable physical order even though the geocentric conception of the world has been proved as wrong. At the end of the 17th century the alchemist Johann Georg Gichtel depicted the planets in his famous “planetary man” exactly according to this planetary sequence. Here the planets mark the chakras, the seven main energy centres of man, starting from the crown chakra with Saturn down to the root chakra with Moon. 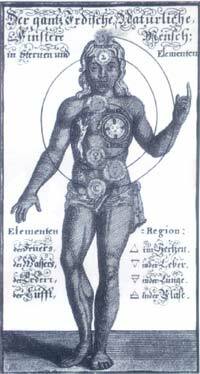 The alchemists called the chakras ”the seals of the planets” or ”the furnaces of the soul”. Gichtel hatching his planetary man in black called the picture a description of the ”entirely earthly, natural, dark man”. The black hatching represents the ”Nigredo phase”, literally ”the black”, the dark, low-vibrating matter at the beginning of the Great Work. Thus it is a similar phase as shown in the Vitriol seven-pointed star: there the beginning of the work is symbolised by the black bird on the skull. In the same way as the emblems in the seven-pointed star demonstrate the transformation of matter, ”dark planetary man” has to be transformed and raised. Thus, the planetary order and assignment of the chakras as shown in Gichtel’s picture represent the very beginning of the process. They mark a phase in which forces of solidification, slowing down, and finally dying, dominate the processes. An indication however is hidden in both pictures, the one of the seven-pointed star and the one of planetary man, an indication as to how the planets can combine their action, in order to elevate and illuminate man; and in order to transform dark lead into sunny gold vibrating high. Now let us have a look at the seven-pointed star of the Knight Templars in France. An old map of the Knight Templars shows the position of the seven main Commanderies which are arranged in the form of a star. Also here the rays of the star are in the same order as the planets. But there is a difference: they are arranged in a contrary order. Close to the centre of the star the name of Bourges, a town, stands out. Interestingly enough the famous alchemist Fulcanelli described Bourges as the ”Keystone of the Great Work of the Alchemists in Europe”, without however giving any further explanation. Only in 1998 this riddle was revealed, partly at least. 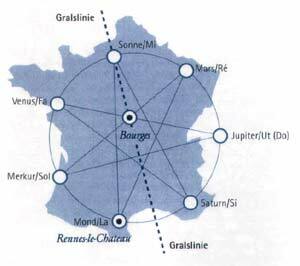 Geomantist Peter Dawkins had found an extensive energy line, a so-called ley-line, that passes through France starting from Saintes Maries de-la-Mer (the most important place of pilgrimage of the Sinti and Roma), and running through Bourges and Chartres, and even through England. As many places of the legend of the Grail are located on this line, Dawkins called it the ”line of the Grail”. Exactly this line of the Grail passes through the centre of the seven-pointed star of the Knight Templars. In the North of France it divides the ray of the Sun precisely, and in the South it runs between the rays of Saturn and Moon into the Mediterranean. Mind you that this line of the Grail is not depicted in the old map of the Knight Templars. Could this coincidence be mere chance? Hardly: Sun, Moon and Saturn, the three planetary rays placed on the line of the Grail represent the trinity of body, spirit and soul. In the alchemy they stand for Sal, Sulphur and Mercurius. And if we look at the Vitriol seven-pointed star, the deliberate placement of the seven-pointed star is even more apparent. The three rays of Sun, Moon and Saturn in the contraction VITRIOL stand for the beginning, middle and end of the word, i.e. the letters VRL. VRL or VRIL is the name of the all-pervading, invigorating elemental force of creation. The remaining letters IT and IO form the Latin word ITIO, in English ”going” or ”travel”, meaning the journey or the path, or rather the flow of the universal power of creation through the seven planets in the form of seven divine ”lights”, and finally the course of life energy through body, spirit and soul, and the seven chakras of man. Drawing according to a model of the seven-pointed star of the Knight Templars in France that marks the position of the main Commanderies of their Order with the line of the Grail. The Knight Templars associated their seven-pointed star in France very purposefully with the flow of life energy on our earth. Such a sensational discovery was just made before the turn of the millennium. Like Dawkins, the geomantist Siegfried Prumbach has found extensive energy lines. Four years ago he discovered that all these ley-lines form a regular geometrical pattern: a global energy grid that is mainly built by 12 large pentagons, forming a so called dodecahedron (one of the five Platonic solids). 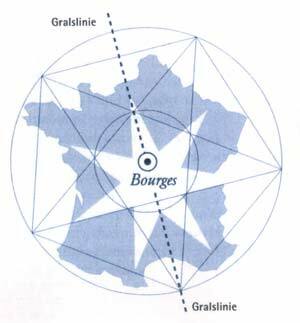 Exactly in the centre of one of these large pentagons which is superimposed on Europe and North Africa, Bourges is located as the centre of the seven-pointed star. And, the line of the Grail too, runs exactly through the centre of this pentagon. The Knight Templars placed the main Commanderies of their seven-pointed star close to strong natural sites of power, for example the point of the Moon at Rennes-le-Chateau (a legendary place of the Catharians) and the point of the planet Mars at Verdun (actually this point of Mars, the god of war, attained sad fame during the First World War). The Knight Templars connected the flow of energy between the seven sites of power or ”chakras of the earth” in France in a particular way. The inner pentagon of the large European Pentagon is exactly superimposed on France. At its centre is the town Bourges, the ”keystone of the Great Work of the alchemists in Europe”, and the seven-pointed star of the Knight Templars. The secret knowledge of the alchemists is in regard to the way the energies in the seven-pointed star of the planets are to flow in order to have a vitalising effect. They knew how to transform the ”dark planetary order” of the Nigredo level to ”gold” and to brightness. They called this highest level of vibration ”Rubedo” (= reddening), according to the colours appearing during the transformation of matter in the Great Work. The endeavour of all great alchemists was to reach this highest level of vibration in their laboratory work and within themselves. For this purpose Paracelsus transformed solid metals and gems into unique lucid elixirs. Used as remedies they are meant to ”brighten up” man in the same manner, i.e. to raise him in his vibrational level, and to heal and support the development of character and consciousness.